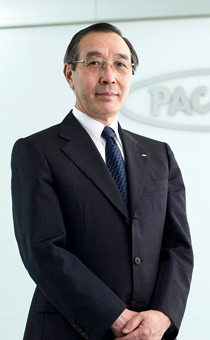 ﻿ Investors (message)｜Pacific Industrial Co., Ltd.
My name is Shinya Ogawa and I am the President of Pacific Industrial Co., Ltd. I would like to extend my friendliest greetings to all of our shareholders and investors. The automobile industry is now in a historical period of transition, and is undergoing a large structural transformation. Many paradigm shifts are occurring simultaneously, including competition from developing countries such as China and the accelerating popularization of eco cars. The domestic and international market environment is becoming fiercer and global competition is escalating. To deal with these structural changes, our company has come together and created an interim business plan called “OCEAN-18”. We are also planning six innovations called “Cost Innovation 30 Promotion” to reduce total costs by 30%, and are working hard to implement these groundbreaking innovations while strengthening our basic strategies and corporate structure. In addition, to commemorate our 80th anniversary in 2010, we have created the “PACIFIC GLOBAL VISION 2020,” with a long-term vision looking forward to our 100th anniversary in 2030. We are now facing new goals and working hard to further improve our company's value, and would like to ask for the continued support of you, our shareholders and investors.